Are you concerned about which Rockwell scale to use for thin materials? Of primary importance in Rockwell scale selection is material thickness. Since the 30 Rockwell scales are distinguished by total test force as well as the indenter type, a load or force that is excessive for a given material thickness will ultimately be influenced by the support anvil as the material is fully penetrated. 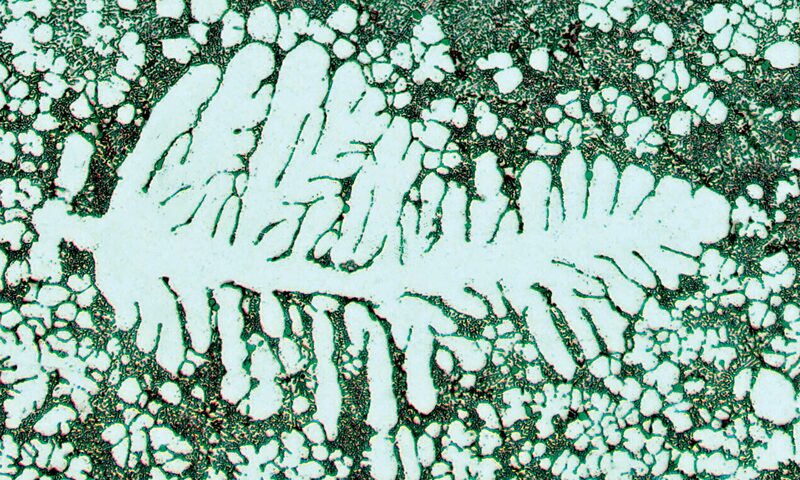 Interruption in material flow such as this can result in erroneous readings and significant misinterpretation of the actual material hardness. To assist with the decision process, ASTM provides scale thickness requirements both in tabular as well as graphical form. We recommend that these are used as a reference guide in deciding suitable scale based on your material thickness. A general, approximate only, rule is that the material should be a minimum of 10 times the depth of the indentation when using a diamond type indenter and at least 15 times the depth when using a ball type indenter. If necessary, the actual depth of any indentation can be calculated to confirm this requirement is being met. Typically, depth calculation is not necessary as the ASTM reference tables and graphs provide adequate information to make an educated decision. A rule of thumb that should be followed in order to ensure accurate test results is that no deformation of the material should be evident on the supporting (underside) surface of the material. As the thickness of the material is reduced, it becomes necessary to reduce the applied force to reduce “breakthrough” of the indenter. This can be achieved by choosing a Rockwell scale that utilizes lower test forces and has the appropriate conversion values. As an example of referencing the tables to determine suitable hardness scale, suppose there is a requirement is to perform hardness test on a sheet of steel that is 0.51 mm. (0.20 in.) thick that has an approximate hardness value of 57 HRC. ASTM E18 shows that material of 57 HRC hardness must have a thickness of 0.76 mm (0.030 in) to obtain valid results, eliminating the possibility to perform a standard HRC scale test on this particular sample. Reviewing ASTM E 140 conversion tables illustrates that 57 HRC approximately converts to 15N 88.9, 30N 74.8, or 45N 63.2. 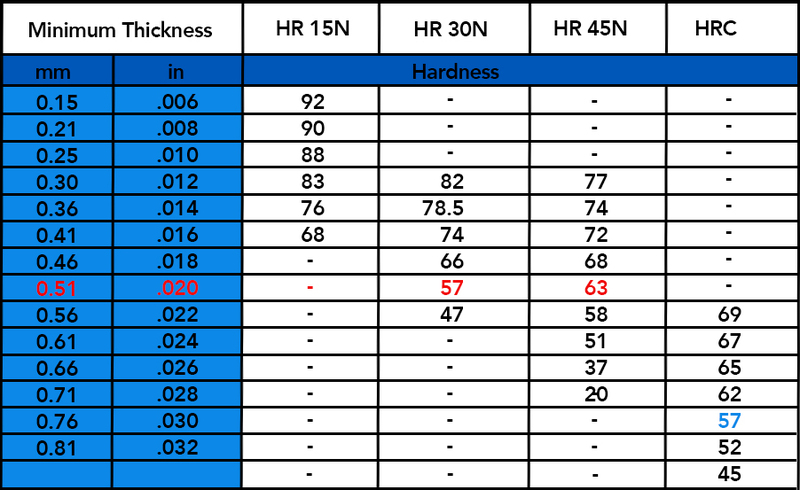 Referring to the ASTM minimum thickness chart we can see that for material .51 mm thick there are two scales to choose from, HR30N and HR45N. According to the chart, at .51 mm the material should be at least HRN45 63 or HRN30 57 indicating that either converted scale is suitable (remember, the converted value is HR45N 63.2 and HR30N 74.8). When more than one choice is available it is recommended that the higher test force scale is chosen, in this case HR45N. If a suitable Rockwell scale is not possible due to not meeting minimum thickness requirements, the material may be tested on either the Knoop or Vickers Microhardness scales. Many Rockwell hardness blocks are available on the Quick Ship program.